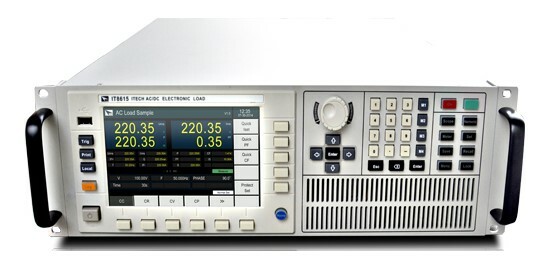 IT8600 series is the latest AC/DC electronic load launched by ITECH and 3U small volume can achieve the 420V/20A/1800W input scope, with the adjustable frequency of 45HZ~450HZ.The unique oscillographic display function can display the voltage and current input waveform. It is equipped with measurement modes of different parameters such as surge current, peak value, effective value and PF(power factor) and voltage harmonics of as high as 50 orders can be measured so as to make a comprehensive analysis of the performance of object to be measured. The product is equipped with standard GPIB, LAN and USB communication interfaces and can provide rapid and stable communication quality. The product is mainly used to provide perfect solution for the test of UPS, inverters, AC power and relevant AC electronic components. IT8615 provides powerful data measurement function, which cannot only support measurement of conventional parameters such as Vrms, Vpk, Vdc, Irms, Ipk, Idc, W, VA, VAR, CF, PF and Freq, but also provides a unique voltage harmonic analysis function to verify the harmonic interference of the object (uninterruptible power supply, generators, etc.) to be measured over the grid. It is equipped with function to conduct analyses for voltage harmonic of as high as 50 orders. The most unique highlight of IT8615 lies in the oscilloscope display function, which can display the input voltage and current waveform of the object to be measured. Under the harmonic measurement mode, the analysis result of the percentage of different harmonics can be displayed in the bar diagram. The diversified display mode can bring a new use experience for the user. IT8615 offered multi-sets parallel, three-phase and parallel three-phase function, widely used in three-phase AC power supplies or high power testing occasions. In parallel three-phase applications, diversify collocations are available for user's actual demand.